Google I/O 2016: Google previews messaging app Allo and video calling app Duo for Android and iOS. Today at I/O 2016, Google shared a preview of two new apps called Allo and Duo. Allo is a new app for smart messaging while the Duo is for video calling. Both Allo and Duo are based on your phone number, so you can communicate with anyone regardless of whether they're on Android or iOS. Both apps will be available this summer on Android and iOS. Allo is a new messaging app that also comes complete with the Google assistant, so you can interact with it directly in your chats, either one-on-one or with friends. Because the assistant understands your world, you can ask for things like your agenda for the day or photos from your last trip. If you're planning a dinner with friends, you can ask the assistant to suggest restaurants nearby, all in one thread. 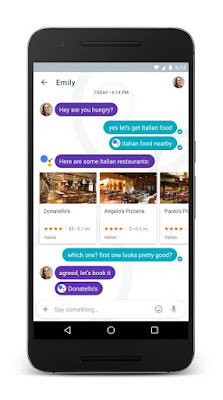 Allo includes Smart Reply, which suggests responses to messages based on context, and comes with fun ways to make your chats more expressive, including emojis, stickers, and the ability to get creative with photos. There's also an Incognito mode that provides end-to-end encryption, discreet notifications, and message expiration. In addition to Allo, Google also introduced Duo, a companion app for one-to-one video calling. Google also introduced a feature called Knock Knock, which gives you a live video of the other caller before you answer.